Fractures of the mandibular condyle are one of the most commonly occurring mandibular fractures. Management of these fractures has always been a controversial issue. 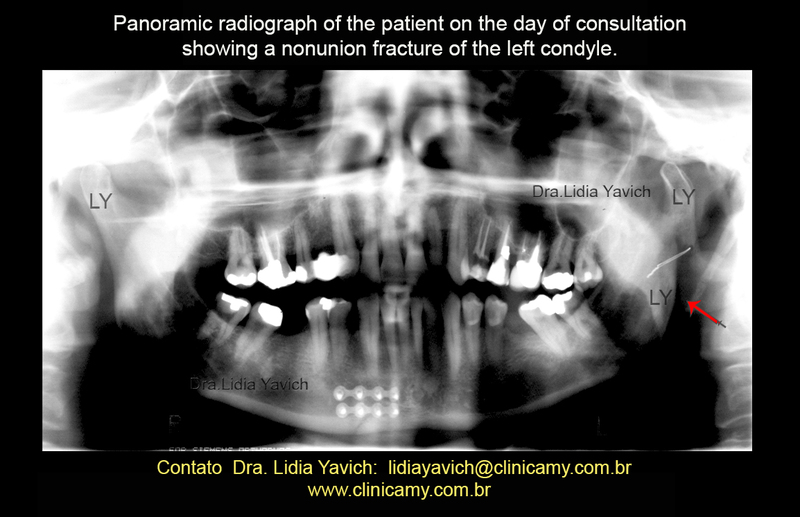 One of the complications of mandibular condyle fracture is nonunion. This case report documents a 57-year-old male patient with a complication nonunion of the left mandibular condyle 4 months after surgery and the resolution of this case with a neurophysiological alignment of the segments, without a new surgery or internal fixation. A 57 year-old male patient was referred to the clinic by his dentist. His principal complaints were lack of strength when chewing, difficulty in opening the mouth, cervical pain, pain in the TMJs and ringing in the left ear. Past history revealed that the patient fell in the bathroom 4 months before the consultation, hitting his jaw and fracturing his mandible. 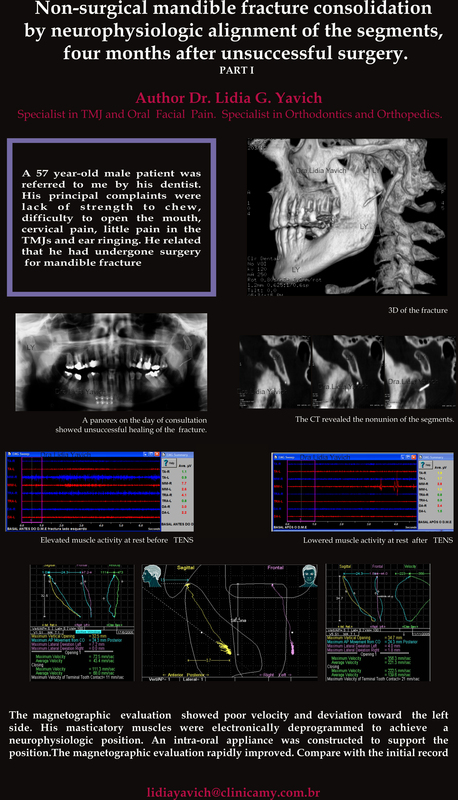 He was subsequently surgically treated for fracture of the symphysis and the left mandibular condyle. Extra oral examination did not reveal any obvious swelling. After performing all the clinical evaluations a panoramic radiograph was solicited where the nonunion of the left condyle was noticed. Dental abnormalities included missing 14, 36 and 46 and a posterior open bite on the left side. Panoramic radiograph of the patient on the day of consultation showing a nonunion of the left condyle. Asymmetric mandibular condyles. 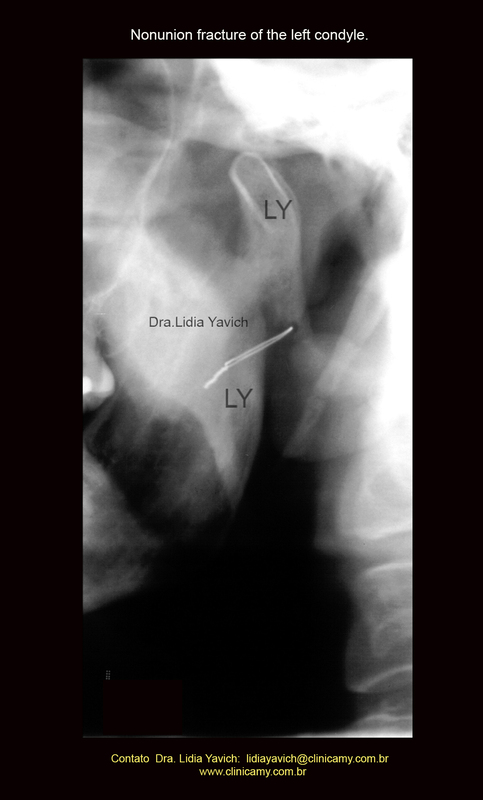 Radiopaque image compatible with osteosynthesis wire in the lower region of condylar apophysis on the left side with bone fragment displacement. In the region of the chin on the right, horizontal radiopaque images compatible with osteosynthesis devices for contention of the fracture of the anterior mentonian symphysis. Magnification of the left mandibular condyle on the panoramic radiograph. 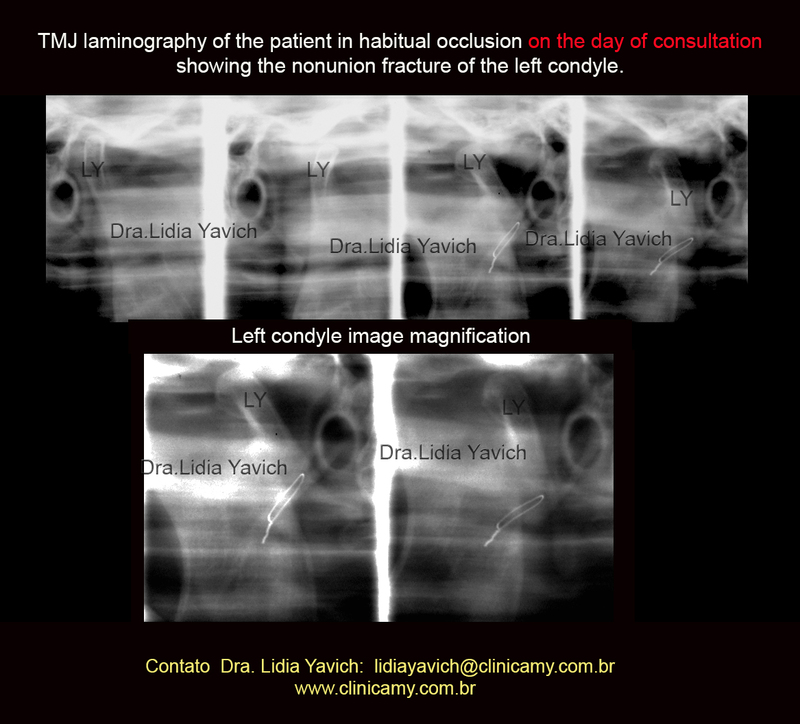 TMJ laminography of the patient on the day of consultation showing the nonunion fracture of the left mandibular condyle 4 months after surgery. A CT was solicited to get a more accurate diagnosis. 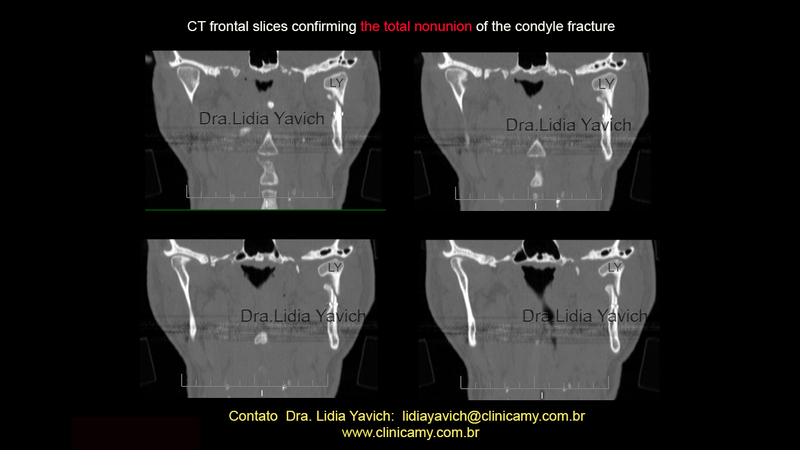 CT sagital slices confirming the total nonunion of the mandibular condyle fracture four months after surgery. CT frontal slices confirming the total nonunion of the mandibular condyle fracture four months after surgery. 3D reconstruction showing the total nonunion of the mandibular condyle fracture four months after surgery . 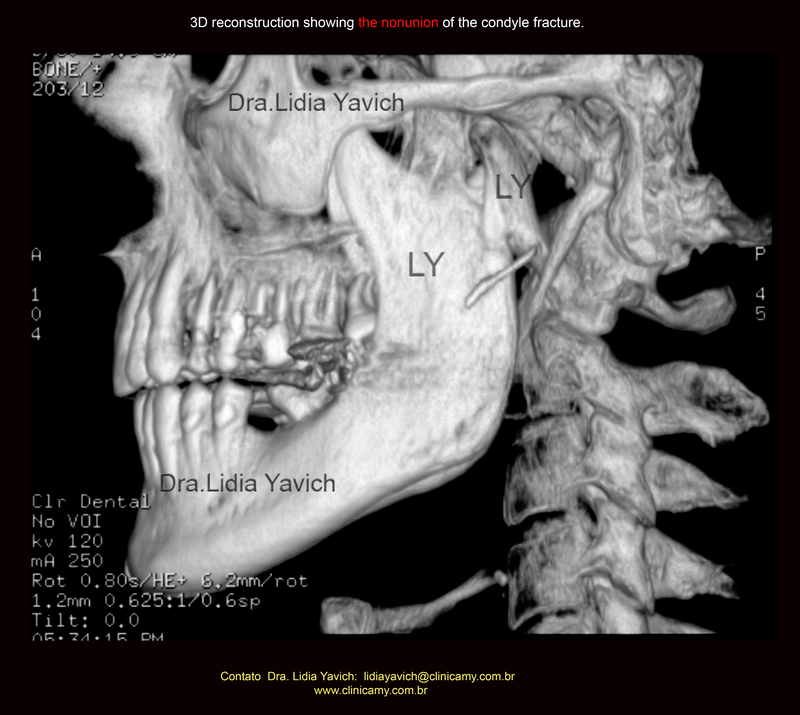 Another 3D reconstruction showing the total nonunion of the mandibular condyle fracture four months after surgery . 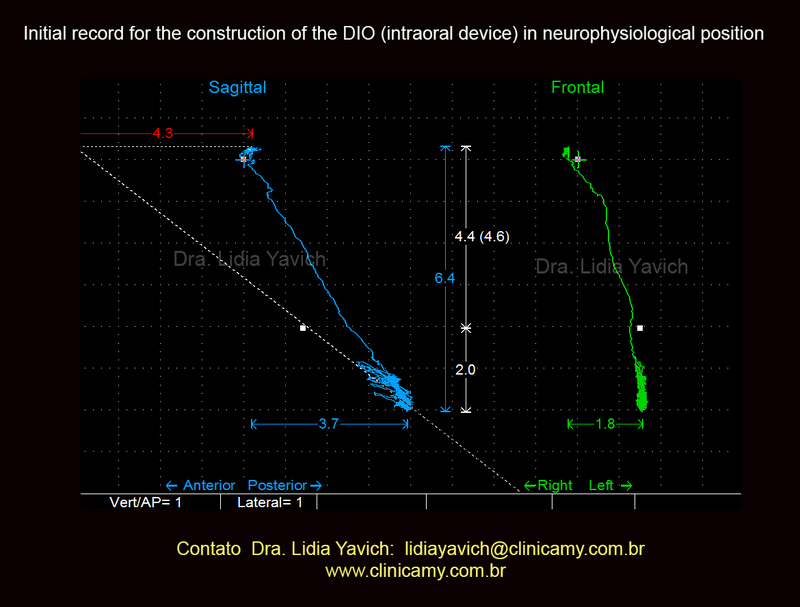 Surface electromyographic record before electronic deprogramming on the first consultation: elevated activity of the right masseter, right trapezius and right digastric at rest. All this masticatory muscles lowered after electronic deprogramming. 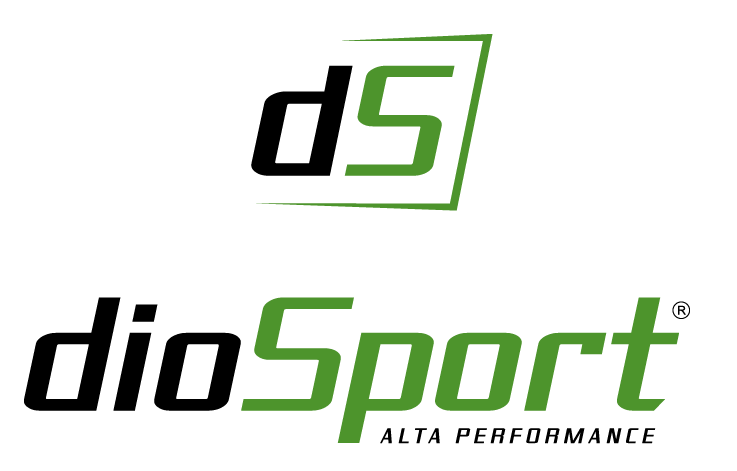 Decreased masticatory muscle activity at rest after electronic deprogramming. 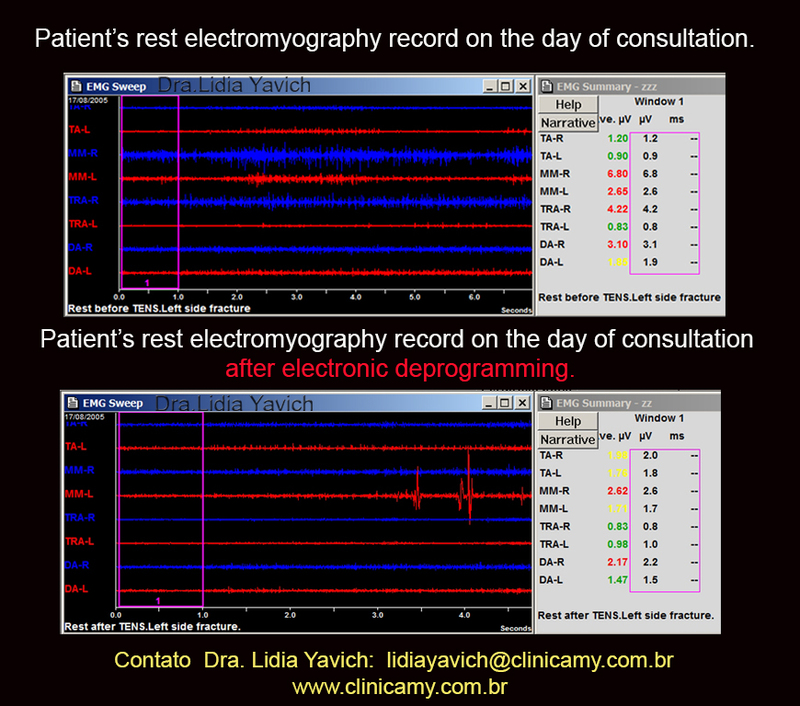 Comparative rest electromyography records before and after electronic deprogramming. Based on the case history it´s clinical and radiographic features, this case was diagnosed as nonunion fracture of the left mandibular condyle . Nonunion is a complication in mandibular fractures. The causative factors include delay in treatment, infection, inadequate immobilization, and improper internal fixation; concomitant infection may be present. Other suspected contributory factors include failure to provide antibiotics, delay in treatment, teeth in the fracture line, alcohol and drug abuse, inexperience of the surgeon, and lack of patient compliance. Generally treatment of nonunion consists of standard techniques of debridement, antibiotic therapy and further immobilization. We referred the patient back to the surgeon where a new surgery was proposed. 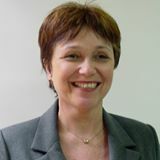 Considering the categorical decision of not performing a new surgery the patient returned to the clinic and a conservative approach to treatment was proposed. The patient was informed about possible limitations due to his age. Analyzing the alternatives he accepted the clinic’s proposal. Ultra low frequency and low amplitude, transcutaneous electrical neural stimulation (TENS) of the mandibular division of the trigeminal nerve (V) was used to relax the masticatory muscles to record the rest position of the mandible. That tridimentional mandible rest position was recorded in the form of a bite occlusal registration, which was later used to fabricate a Intraoral device. This is a removable mandibular appliance that in this case must be worn during day and night by the patient. 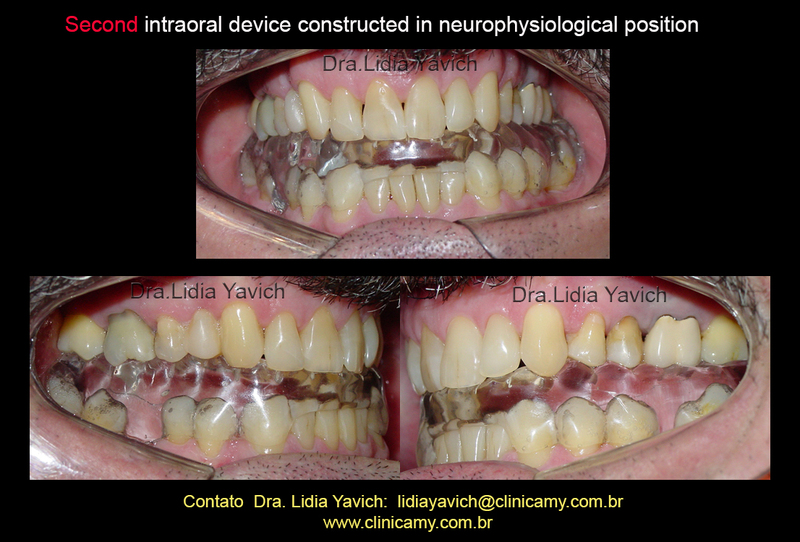 This intraoral appliance, tested electromiographically and magne­tographically, support this neurophysiological position. The patient was asked to wear the intraoral appliance full time. 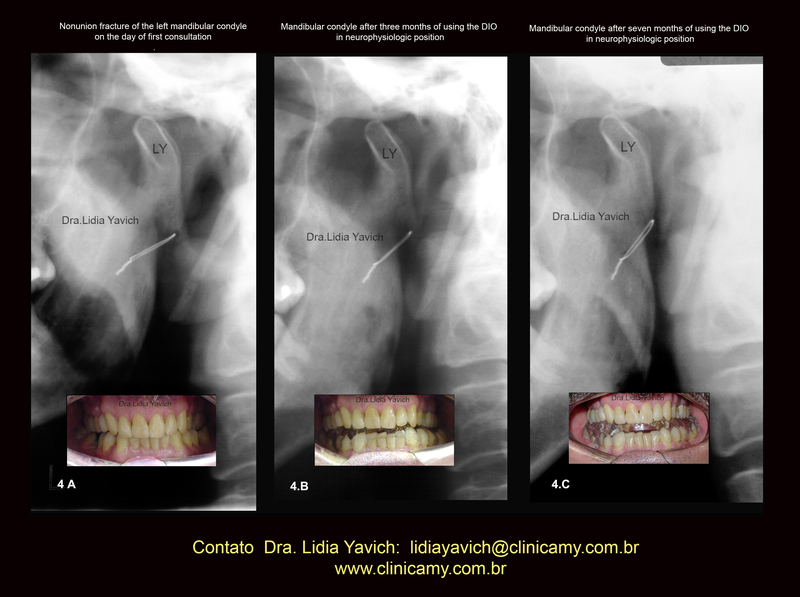 The dynamic evaluations improved and the patient felt no more pain, and no difficulty to chew. 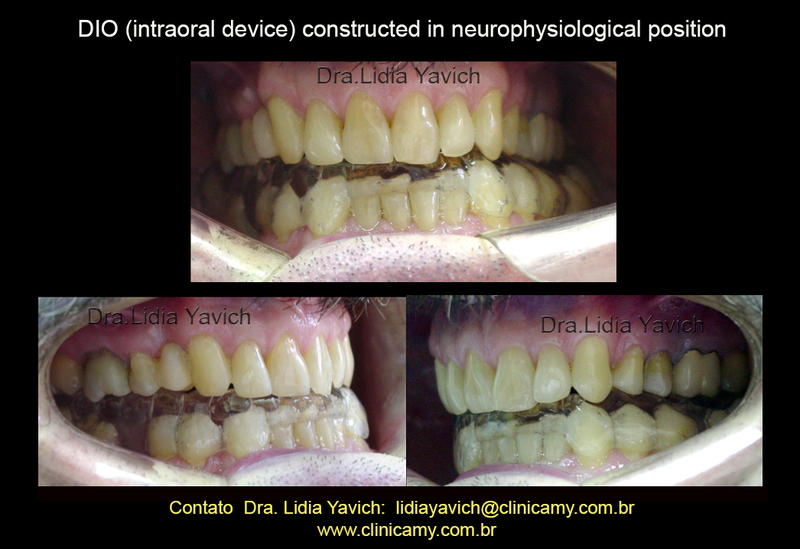 During the treatment new intraoral device in neurophysiological position was constructed. A second panoramic radiograph was solicited after three months. The new panoramic radiograph showed the improvement of the condyle position and finally, four months after this control a third panoramic radiograph was solicited where we can see the union of the fracture. 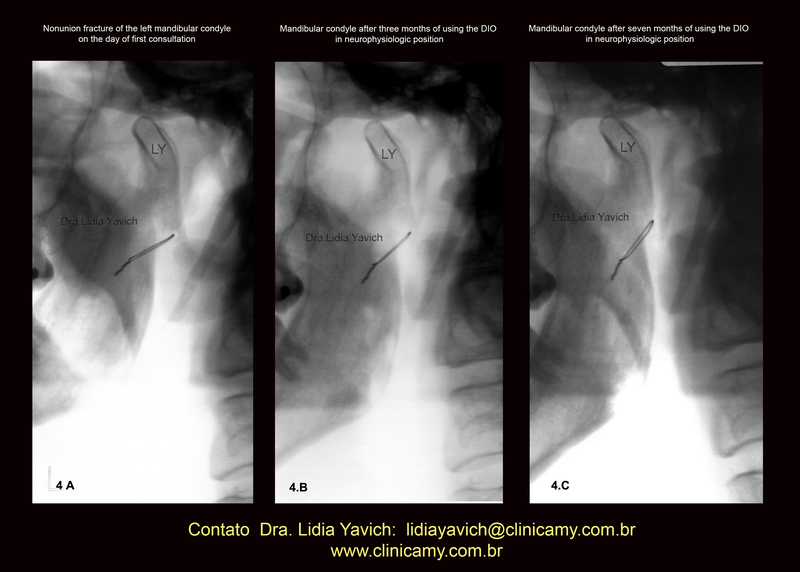 Comparative image of the left mandibular condyle of the first panoramic radiograph of the patient on the day of consultation (4A), second panoramic radiograph three months after (4B) and third panoramic radiograph (4C) four months after the second control showing the improvement of condyle position and the union bone. LOOK THE UPRIGHTING OF THE WIRE FROM THE SURGERY. 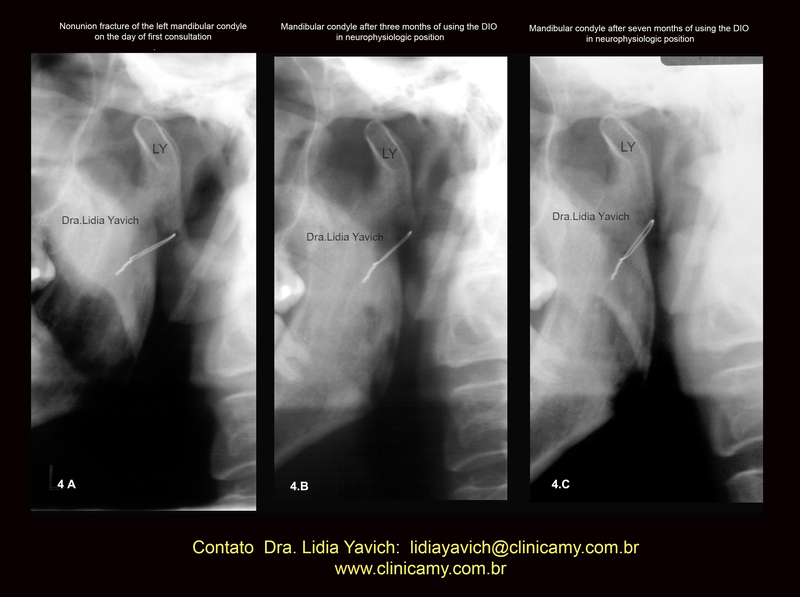 Comparative image of the left mandibular condyle of the first panoramic radiograph of the patient on the day of consultation (4A), second panoramic radiograph three months after (4B) and third panoramic radiograph (4C) four months after the second control showing the improvement of condyle position and the union bone. 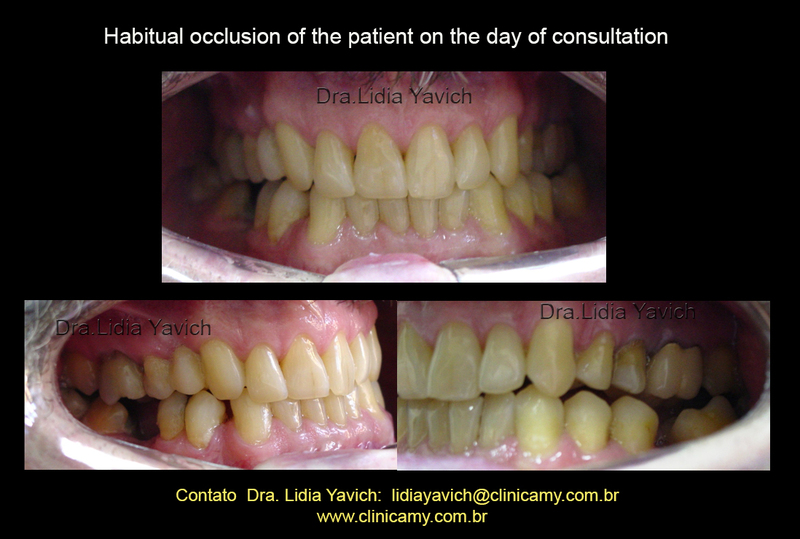 The frontal images of the habitual occlusion on the consultation day, four and seven months after initiating the treatment are also posted. 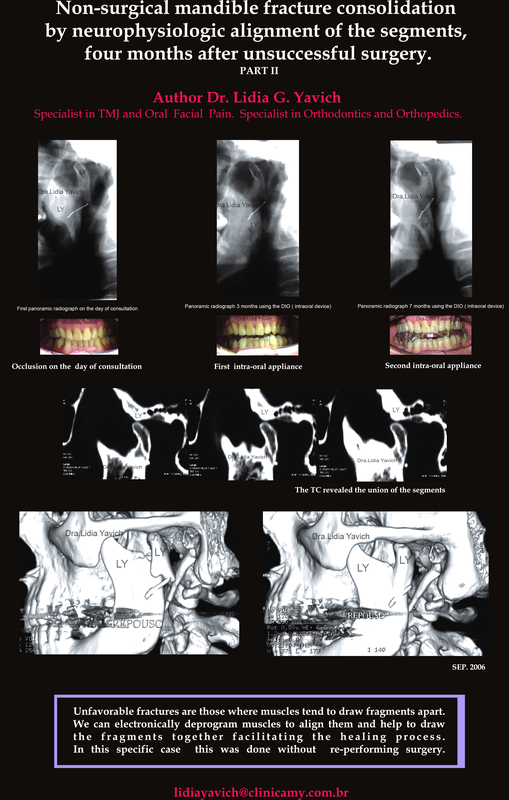 COLOR INVERSION of the comparative image of the left mandibular condyle of the first panoramic radiograph of the patient on the day of consultation (4A), second panoramic radiograph three months after (4B) and third panoramic radiograph (4C) four months after the second control showing the improvement of condyle position and the union bone. 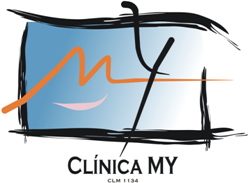 A new CT was solicited and clearly showed the union of the fracture, without submitting the patient to a new surgery and without using any maxillomandibular fixation (MMF) 3D reconstruction showing the nonunion of the left mandibular condyle after four months surgery and the later union of the mandibular condyle after neurophysiological treatment. Fractures where the muscles tend to draw fragments together are more favorable than those fractures where the muscles tend to draw fragments apart. The displacement of fracture fragments is observed in mandibular condyle fractures. The most commonly observed type is the displacement of the condyle head to the anteromedial side because of lateral pterygoid muscle action. The ability to place the mandible in a spatial relationship by measuring the masticatory muscles at their rest length can be an important auxiliary tool to assist in the recuperation of condylar fractures.